Each year over 34 million Americans hang Christmas ornament on their trees. Choose from our wide selection of historic and patriotic ornaments that will be treasured for years to come. From our popular White House ornament to the Washington DC series these ornaments are all keepsakes that you will be proud to display. Save money by purchasing the Official 2019 White House Historical Association, National Cherry Blossom Festival, and Washington DC Cherry Blossom Ornament. This beautiful detailed 24 karat gold-plated Cherry Blossom ornament honors the spring flowering trees planted around the National Mall and Thomas Jefferson Tidal Basin. We are sure this ornament will be cherished in your family for generations. Save money by purchasing the Official White House Historical Association and National Cherry Blossom Festival Ornament Set. 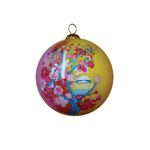 The Official 2018 glass ball ornament features a hand painted scene of blooming Yoshino cherry blossom flowers around the Jefferson Tidal Basin. The Washington Monument can be seen in the background. Delight in this fun and festive rendition of the US Capitol Building with an over-sized US Flag waving behind it. At the heart of Washington DC, this landmark building will inspire patriotism and pride on your Christmas tree this year! 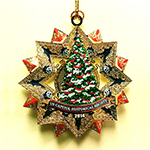 The 2016 Ornament honors President Herbert Hoover. The concept of the ornament remembers the firefighters that put out a fire on Christmas Eve 1929. This 14 karat gold and enamel ornament is sure to be a hit with firefighters, first responders, paramedics, family, friends, and business clients. Non tarnishing silver bookmark and ornament features a giclee print of the White House Christmas Tree Lighting Ceremony, December 1941 by Tom Freeman. Support the White House Historical Association and the US Capitol Historical Society by buying the official 2016 Christmas Ornaments. Supplies are limited, so order your set today. 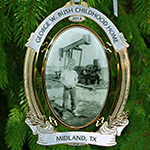 The administration of Calvin Coolidge, thirtieth President of the United States from 1923 to 1929, is the inspiration for the 2015 White House Christmas ornament. This ornament features President Barack Obama, standing steps of the U.S. Capitol along with Michelle by his side, being sworn in by Chief Justice John Roberts (with Michelle at his side) taken during the 56th U.S. Presidential Inauguration on January 20, 2009. The 2009 Washington DC Memorial Ornament Set features the Lincoln Memorial and Jefferson Memorial located on the National Mall in Washington DC. The Official ornament of the United States Senate is crafted of several layers of multi-color cut-work brass with a 24 k gold finish. A bay laurel wreath surrounds the Capitol Building. White House Christmas Ornament is proud to present the 2015 Dove of Peace Christmas ornament. The ornament represents a symbol that held special meaning for President George Washington after he won independence for the United States. These beautiful glass ornaments can be enjoyed outdoors all year round as an exquisite garden decoration or patio adornment. These beautiful red, white and blue ornamental balls are hand-blown glass from artisans that have been in the craft for generations. No two are the same and they measure approximately 4" wide. These glass ball ornaments are made with pride in the U.S.A.
No ornament collection is complete without the new White House North and South Portico Ornament Gift Set. When you order these two ornaments together in a set you save time and money. This classic Capitol design is crafted from the marble of the east front steps removed in the 1995-96 renovations. The United States Armed Forces ornament is a small token of how grateful we are to the Army, Navy, Airforce, Marines, and Coast Guard. Since our nation's founding, the primary obligation of the national government has been the common defense of these United States. 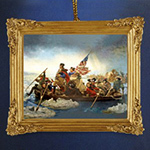 The 1996 Apotheosis of George Washington Ornament is the first edition in the series, "America's Christmas Ornament." The 2013 White House Christmas ornament is a beautifully decorated tribute to Woodrow Wilson, the twenty-eight President of the United States. This White House ornaments features an American Elm tree planted by President Wilson in front of the White House as a symbol of hope during World War I. 2014 Mount Vernon Christmas Ornament. This year's ornament celebrates the presidency of William McKinley (the 25th Commander in Chief) as well as the long tradition of music in the White House. The McKinley administration is remembered by history scholars as a time when America first became a world-wide superpower. The Lincoln Memorial is a United States Presidential memorial built to honor Abraham Lincoln. Completed in 1922, the memorial is located on the National Mall in Washington, D.C. The Pledge of Allegiance Ornament is designed to reflect our loyalty to the flag of the republic of the United States of America. The Pledge of Allegiance was composed by Francis Bellamy in 1892 and formally adopted by Congress in 1942. The snowy scene of the Capitol building featured in this beautiful collectible is enhanced by this ornament's snowflake shape made of 24 kt gold filigree. The Official Ornament of the United States Senate features a view of the east front of the Capitol superimposed over a translucent blue window. Depicting the United States Capitol dome with the Capitol Christmas tree twinkling in the night sky, the official 2014 Ornament of the United States Senate is surrounded by three 8-point stars. The Official Holiday Ornament of the United States Senate pays tribute to the Old Senate Chamber and includes fabric from the 1976 Congressional draperies. White House Christmas Ornaments is proud to present the 2015 Sterling Silver Eagle Flag ornament. The American eagle featured in the ornament clutches arrows and a United States flag in its talons. This highly collectible gold finish ornament design is inspired by the 12 Christmas trees that surround the Ford Orientation Center and the Donald W. Reynolds Museum and Education Center at Mount Vernon. 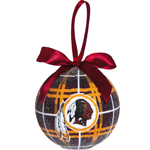 Any fan of the Washington Redskins needs an eye catching ornament on their Christmas tree that displays their team loyalty! E Pluribus Unum is Latin for "out of many, one." This Latin phrase was once the United States� motto and can be found on the official seal of the U.S., among other places. The thirteen letters in "E Pluribus Unum" represents the thirteen colonies that united to form the Republic we know today. The Official Unites States Supreme Court ornament. This three dimensional silver-plated ornament accurately depicts the main entrance of the Court. Rembrandt Peale's 1823 painting of George Washington, known as the "Porthole Portrait", was painted nearly 24 years after Washington's death. Peale based more than 70 versions of this portrait on a life study done in 1795 when Washington was 63 years old. In December of 1776, decimated by superior British forces, suffering from disease, desertion and lack of funds, General George Washington faced the unthinkable � losing the war. Despite all advice to the contrary, Washington made a courageous decision that is considered to be one of the boldest in military history. This gorgeous 24 k gold finished ornament honors the enduring principles embodied in the Constitution of the United States, depicting the White House, Capitol Building and Supreme Court. The Capitol Christmas Tree is surrounded by a 24kt. etched and enameled starburst. Etched into the back of the ornament is the Capitol dome. Beautifully gift boxed with provenance. 3.5" x 3.5"
The Woodrow Wilson Administration is the theme for the Official White House Christmas Ornament honoring the 28th President of the United States. The official 2012 White House Christmas ornament is a great Washington DC souvenir. The White House ornament features William Taft, the twenty-seventh President of United States, and his wife riding in the first automobile (White Motor Company's Model M) used to transport the First family. The official 2011 White House Theodore Roosevelt Ornament the 26th President of the United States and his family. The front of the ornament shows Santa Claus crossing the North Lawn while the reverse side shows the Roosevelt family gathered around a Christmas Tree. Get the 2011 and 2010 White House Ornaments in this fantastic gift set. Save time and money when you purchase these two collectibles together. Makes a great gift for someone starting their own collection. The 2011 Mount Vernon ornament commemorates the story of Washington's prayer in the snow at Valley Forge on Christmas Day, 1777. The ornament is two sided with a painting of the Mount Vernon Estate in a scene and the other showing General Washington with one knee down praying next to his horse. The 2011 U.S. Capitol Holiday Tree & Carriage Ornament features a night scene with a star-lit sky and a couple riding in an open sleigh in front of the Capitol Building and a Christmas tree twinkling in the snow. This Masonic ornament commemorates the 200th anniversary of the laying of the cornerstone of the United States Capitol. This unique ornament marks a historical turning moment in the history of our great nation: George Washington's famous crossing of the Delaware river on Christmas night, 1776. 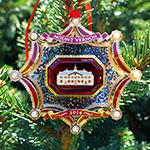 The 2007 Mount Vernon ornament was created to celebrate the 275th anniversary of George Washington's birth as well as the enduring iconic style of his home. The North Portico of the White House is what most people think of when conjuring up a visual image of the White House. The portico was added 1830 and was built in accordance of the Federal style of architecture in keeping with the original design. This intricately detailed, 24k gold-plated commemorative 9-11 Remembrance Ornament pays tribute to that dire day more than a decade ago. The foreground of the ornament features 8 color-guard members with their respective military flags standing on a base that says "WE WILL REMEMBER - SEPTEMBER 11, 2001. The centerpiece of the 2013 Mount Vernon ornament was taken from a lithograph titled: "The Home Of Washington, Mount Vernon, Virginia" and shows the East Front of the mansion from around 1858. 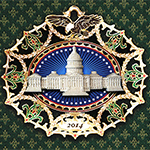 The 2013 Supreme Court Christmas ornament features a dimensional Supreme Court, the background details of this dimensional ornament are taken from the coffered ceiling of the Upper Great Hall and the carpets of the East and West Conference Rooms. This Pentagon ornament is a beautiful Washington DC souvenir that features the Pentagon (including inner rings) with an American Bald Eagle sticking its head out (in full 3D color), from the 5 acre "center plaza" in the middle of the Pentagon. The ornament is surrounded by a laurel wreath on both sides with another eagle, this one gold, at the top of the ornament. Plated in 24k gold, the official 2012 Capitol Hill Historical Society's ornament celebrates the Society's 50th anniversary. Extremely intricate in its design-detail and execution this year's ornament depicts the Capitol Building in a snowy winter scene with tree branches off to the sides for an artistic touch. DC Gift Shop is proud to announce the arrival of the 2012 Mount Vernon Hospitality Ornament. George and Martha Washington were famous for their hospitality at their Mount Vernon home and their willingness to share their home with numerous guest. This large (four inches wide and three inches tall) 3-D Washington, DC landmarks ornament is sure to please. On a backdrop of the Stars and Stripes are three-dimensional renderings of the U.S. Capitol Building, the Washington Monument, and the south-facing entrance (South Portico) of the White House, complete with a flag flying atop the House. Originally, the United States Department of War was headquartered in the Greggory Building, a temporary structure erected during World War I along Constitution Avenue on the National Mall. The War Department, which was a civilian agency created to administer the U.S. Army, was spread out in additional temporary buildings on the National Mall, as well as dozens of other buildings in Washington, D.C., Maryland and Virginia. 2011 U.S. Constitution ornament is a miniature metal reproduction of the original Constitution. A 3D ornament, the brass border is finished in 24k gold. Made in the USA. 2011 Secret Service ornament features the south entrance to the White House (known as the South Portico) in 3D relief, Santa with his reindeer flying above the scene and complimented by holly leaves and berries. The 2011 Supreme Court Christmas ornament features a winter scene outside the Supreme Court building with a man holding a black canopied umbrella. Made from high quality porcelain and includes a ribbon for hanging, this ornament commemorates that fateful day 10 years ago with an American bald eagle situated in front of an American flag with a likeness of the Pentagon on the bottom right. Ornament measures 2-7/8 inches across and flag is painted red, white and blue. Founded in 1894 by a group of men and women, the Columbia Historical Society, as it was called until 1988, had stated as it's goal: "collecting the scattered and rapidly disappearing records of events and individuals prominent in the history of the city and District." This beautiful ornament showcases the Carnegie Library at Mount Vernon Square where the Historical Society of Washington, DC is based. The South Portico addition to the White House was constructed in 1824 and was true to the original Federal design. It is used as an entrance for visiting dignitaries after ceremonies on the South Lawn. The 2009 Official U.S. Capitol ornament will make a beautiful addition to any tree or just as a stand alone decoration. The Capitol Christmas Tree has been recorded as early as to 1919 but it wasn't until 45 years later (in 1964) that a definite procedure/lighting ceremony was adopted. Elegant in its simplicity (although intricately detailed on the 24k gold-plated border). The 3rd Edition US Capitol Apotheosis of George Washington Ornament celebrates Constantine Brumidi's famous work of art and is located 180 ft. above the Rotunda in the United States Capitol. This 2-sided ornament is a snowflake finished in 24 kt. gold. A 3-dimensional miniature of Mount Vernon's East Front is set on a transparent red glass circle in the center of the front of the snowflake with George Washington's cypher set on the reverse. The ornament is 3 1/2" tall and 3" wide. The 2009 White House Historical Ornament Set pairs this year's official 2009 White House Grover Cleveland Ornament with the 2008 White House Benjamin Harrison Ornament. The 2009 White House Grover Cleveland Christmas ornament portraits a cool, snow-falling, winter night at The White House. Inside one of the windows is a huge Christmas tree decorated with ornaments and bright, multi-colored Christmas lights. During his second term as President of the United States, Grover Cleveland and his family had the first Christmas tree to have electric lights in the history of The White House. This official White House ornament honors the twenty-third president of the United States, President Benjamin Harrison (1833-1901). Inaugurated 100 years after George Washington, Harrison became a centennial president and served one term. This ornament is a glimpse of the first Christmas tree ever to have been documented in the White House. The 2008 White House Christmas Ornament Collection features; 2008 White House Benjamin Harrison Ornament, 2008 US Capitol Oval Marble Ornament, 2008 Mount Vernon 150th Anniversary Ornament, and 2008 Secret Service Ornament - The White House Creche. This beautiful glass-blown, hand-painted ornament commemorates the presidential administration of George Washington, first President of the United States, 1789-1797. The 2008 Oval Marble Capitol ornament features the U.S. Capitol -- fashioned from marble removed during the renovations of the East Front of the Capitol -- against a wintry sky. 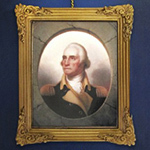 In November 2003, a group of descendants of John Augustine Washington III came to Mount Vernon and brought with them a photograph of a work of art in their possession. It was a beautiful pastel of the Virgin Mary, a painting that the Washington's hung in the mansion's large dining room. This ornament shows Abraham Lincoln, the 16th President of the United States, delivering his Second Inaugural Address. One side of the 2008 ornament shows a painting of the East View of Mount Vernon in a 24 kt. gold finish frame decorated with white snowflakes, green holly leaves with red berries and two red bows. The reverse is deep blue with George Washington's cypher in gold, two white doves, two red bows and "Mount Vernon - Christmas 2008". Since 1967, the White House Creche has been the centerpiece of the East Room. The 47 Baroque figures in the creche are made of carved wood and terra cotta, were created in Naples, Italy in the late 18th century. The 2007 White House Christmas ornament honors the first administration of President Grover Cleveland. The only U.S. president elected to two non-consecutive terms, Cleveland served as the 22nd president from 1885 to 1897. 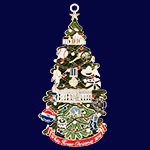 The 2007 Secret Service ornament celebrates the 'National Christmas Tree'. From 1923, the National Christmas Tree has brightened our Nation's capital during the holiday season. The bronze Statue of Freedom by Thomas Crawford is the crowning feature of the Dome of the United States Capitol. The statue stands 19 feet 6 inches tall and weighs approximately 15,000 pounds. The 2007 Marble Dome & Wreath Ornament features a miniature marble Dome of the U.S. Capitol. The marble used in this ornament was removed from the US Capitol during the renovations of the East Front. The 2005 Secret Service Ornament is a 24-karat gold-finished brass ornament which depicts Eisenhower Executive Office Building during the Winter Holiday Season. The 2006 'Air Force One' Ornament portrays Air Force One flying under the Presidential Seal. Miss last year's ornament? You can now purchase the 2005 White House James A Garfield Ornament along with the new 2006 Chester A Arthur Ornament at a discount. Save over 25% when you purchase these ornaments together. The 2006 US Capitol ornament commemorates the 200th anniversary of the steam powered boats. On the other side is the East Front of the Capitol. The 2006 White House Christmas ornament honors the Administration of the 21st President of the United States Chester A. Arthur. The 2006 Mount Vernon Christmas Ornament is a hand painted depiction of George and Martha Washington taking a sleighride around Mount Vernon estate under a moonlit night. The 2006 White House Christmas Ornament portrays Air Force One flying under the Presidential Seal. An American bald eagle holds a ribbon in its beak; the ribbon has the motto of the USA. The elaborate stucco ceiling in the small dining room of Mount Vernon is one of the finest examples of plaster decoration known to its period. Considered by many Americans to be one of their greatest presidents, Abraham Lincoln guided the nation through the Civil War. Lincoln despised war but viewed it as the only salvation of the Union. DC Gift Shop announces the 2005 James A. Garfield Ornament. This ornament is gold-plated brass with a round ceramic stone that features an illustration inspired by a period engraving of the South Front of the White House. This ornament features the Lincoln Memorial, the Jefferson Memorial, and the Washington Monument and has a 24 kt. gold finish.